Financial reporting is a crucial element for any business as it helps in making decisions. Reports such as Profit and Loss, Balance Sheet, and Cash Flow Statements are helpful with the growth analysis of small businesses, but they are typically prepared monthly. So let’s look into how this helps with making intelligent business decisions this month? Gross margin is an indicator of a company’s financial health. It will tell you how much profit the company is earning before operating expenses. Here is a question to ask yourself. Are your margins lower than the industry average? Here at STAC Bizness Solutions, we have extensive knowledge in the salon and spa industry and can provide gross margin insights. Key Performance Indicators (KPIs) measures how effectively a business is reaching their targets. Successful salons and spas set their goals within a given period and monitor them each week. Would you like to increase your new clients or increase the number of retail product sales? Our services provide you with customized reports for salons and spa to track the KPIs required for your business. Ask one of our team members to show you the benefits of having your small business managed by STAC Bizness Solutions. We would be happy to give you a free consultation. Industry benchmarks help in assessing your Salon and Spa business performance by comparing it with your competition. These industry benchmarks help with identifying the gaps in your business and give you valuable insights about where you are successful or where you can make an improvement. Your STAC Bizness consultant will assist in helping you get these reports to make the best decision for your Salon or Spa business. A 12-month forecast is integral for any business to thrive. It is a prediction of future developments such as sale, expenses, and profits. The twelve-month forecast that we will prepare for your Salon and Spa business will assist with making goal-oriented decisions. Management reports give you a deeper understanding of your success. We will identify the data that your business needs and our management reports will help make predictions about the future growth and profitability of your company. At STAC Bizness Solutions, we go beyond just bookkeeping. 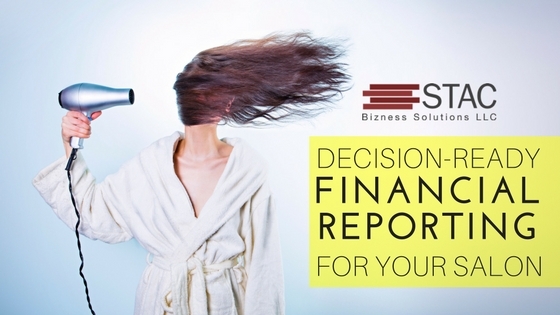 We will provide your Salon and Spa with customized, decision-ready, financial intelligence reports to help your business become more profitable and reach your goals.